Our ongoing utmost concern is for our neighbors; the residents and businesses concerned by the condition of the air surrounding the Reclamation Center. We continue to strive to meet or exceed compliance with regulations set forth by the New Jersey Department of Environmental Protection. Due to its central location and excellent road network, Tinton Falls has been home to a number of solid waste and recycling facilities. In 1976, the County opened its regional landfill at Asbury Ave. and Shafto Rd. Monmouth County currently provides an annual "host community fee" of over $2,400,000 to the Borough of Tinton Falls, acting as a direct offset to local property taxes. 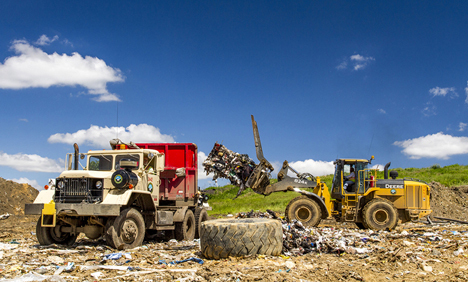 Over $5,000,000 has been spent to date on landfill gas controls, but the nature of the landfill operation can, on occasion, lead to odor problems. The major sources of odors are gases from the decomposing trash, and from the "fresh" trash being delivered. A sophisticated gas collection system (collected gas is then used to create electricity) is added to each new disposal area as it is developed. Negative air flow and fabric/charcoal filters are used in the receiving building to capture and minimize odors from daily trash deliveries.